The National Infrastructure and Construction Pipeline includes schemes announced in the Budget, such as the £28bn National Roads Fund and flagship projects such as East West Rail and upgrading the M6 to an all lane running smart motorway. The Treasury said that to increase efficiency in these projects ministers are encouraging greater use of more modern approaches to construction, including modular construction using the latest digital technology prior to assembly on construction sites. The Government has committed to increasing use of these methods in public-funded projects and launched a call for evidence on a ‘New Approach to Building’. 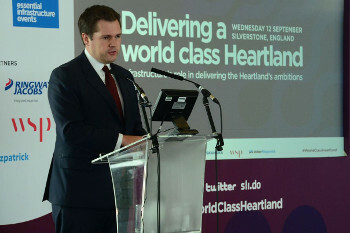 Highways England chief executive Jim O’Sullivan said: ‘At Highways England we recognise the productivity and efficiency challenges that the U.K. construction industry is facing. In recent years we have encouraged more computer-led design, automation, and pre-assembly across all of our construction activities. The Treasury said that, despite significant contributions to the UK economy, the construction sector’s productivity is weak compared to sectors like manufacturing. 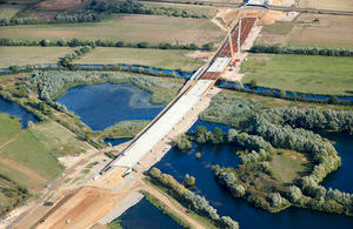 As a positive example of modern construction techniques, it cited the the A14 Cambridge to Huntingdon improvement scheme (pictured), where parts of bridges were developed in a factory and therefore built more efficiently than using traditional methods. Marie-Claude Hemming, director of external affairs at the Civil Engineering Contractors Association, said: 'Delivery of such substantial investment to drive economic growth, goes hand in hand with driving greater efficiencies and exploring opportunities for transformative innovations where possible.